President Donald Trump called investment in infrastructure “a necessity,” but a detailed articulation of a vision for rebuilding the country’s crumbling roads and bridges was absent from a much-anticipated State of the Union address that focused primarily on security concerns and immigration policy. The president, however, stopped short of signaling if or when his team would unveil a proposal that would address the repairs for such crumbling infrastructure, or the requisite cost for a nationwide rebuilding campaign. 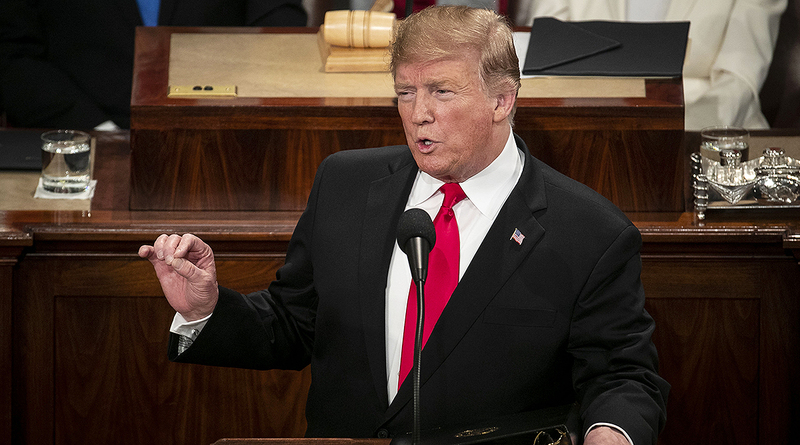 A White House note that expanded on Trump’s address indicated the president “urges Congress to pass a bill that delivers new and important infrastructure investment to rebuild our crumbling roads, aging bridges, crowded airports, and other infrastructure.” The note emphasized support for streamlining the permitting process and highlighted the country’s congestion crisis, but a sustainable funding mechanism for big-ticket projects was missing. Heading into this year, the self-proclaimed “Builder-in-Chief” said infrastructure funding priorities would be made part of his agenda. Last year, transportation leaders on Capitol Hill had dismissed Trump’s 10-year, $1.5 trillion plan. Its significant reliance on non-federal funds proved difficult for authorizers to support. Transportation Secretary Elaine Chao, as expected, praised Trump. Trump’s vague messaging on infrastructure legislation notwithstanding, the desire in Congress to advance a comprehensive package remains alive. Senate transportation leaders recently expressed support for a fiscally responsible measure capable of advancing this year. In the House, Transportation panel Chairman Peter DeFazio (D-Ore.) insists he’ll have legislation ready in a few months. His Republican partner on the panel, Missouri Rep. Sam Graves, welcomed Trump’s remarks. Also missing from the president’s address were references about climate science and the recent partial shutdown of federal agencies at the start of the 116th Congress. In the Democratic response to the State of the Union, former Georgia gubernatorial candidate Stacey Abrams omitted references about infrastructure while focusing on policy initiatives not raised by Trump, insisting the shutdown was avoidable. “We can do so much more. Take action on climate change, defend individual liberties with fair-minded judges,” said Abrams. In recent years, transportation stakeholders representing the freight and commuter sectors have urged lawmakers to pass bills meant to repair and maintain the network of roads, bridges, railroads and ports around the country. Funding authority for highway projects expires in the fall of 2020, and revenue from federal fuel taxes is insufficient to sustain the Highway Trust Fund, the account used to assist states.